Online Montgomery Absolute Auction — Harritt Group, Inc.
10% Buyer’s Premium added to the hammer price to determine the final purchase price. 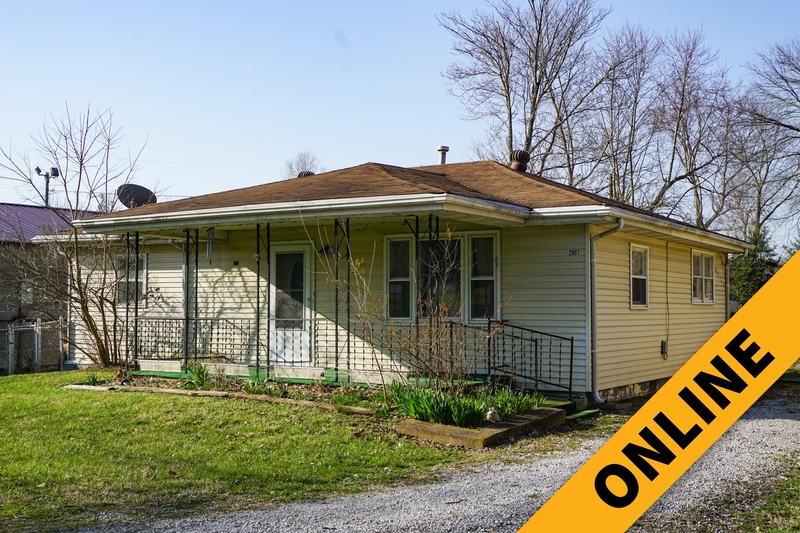 One level mid-century 2/3 bedroom ranch with large shed on .26 acre lot off Charlestown Road centrally located between New Albany and Clarksville in Clark County. Great opportunity to own, selling online to the highest bidder with no minimum and no reserve. Also selling contents including furniture, lawn equipment, tools, household, and collectibles. Register to bid at harrittgroup.com. Attention investment homeowners! One level 1,064 square foot ranch built in 1953 with covered porch, wood deck, concrete patio and large shed on .26 acre lot with fenced backyard located between Charlestown Road and Potters Lane in Clark County. This home of concrete block construction with aluminum siding on crawl space features 2 bedrooms, 1 bath, equipped eat-in kitchen, living room, 3rd bedroom currently used as equipped laundry/utility room, central air & heat. A large 9’ x 10’ detached shed is perfect for storing tools and lawn equipment. A great location easily accessible to restaurants and shopping. Sells online with no minimum to the highest bidder! 10% down payment due within 24 hours, balance due within 40 days. Taxes prorated to day of closing. Possession at closing. Selling as is, all inspections welcomed prior to the auction. Dining room table and chairs, Insignia flat screen TV and modern cabinet/entertainment center. sofa and loveseat pair, single and double door lighted curio cabinets, 2-piece mid-century style display cabinet, modern dining room suite with table, (4) chairs & hutch, modern bookshelf, mid-century dresser, queen size bed with modern mattress and boxspring, modern red cabinet with glass doors, wood 4-drawer file cabinet, vanity stool, lamp table, chair, and storage cabinet. Craftsman yard vacuum with bagger and 4.5HP engine, Louisville Ladder 16′ aluminum extension ladder, Jeep brand wheelbarrow large selection of hand tools includes Bluegrass hoe, sledge hammer, and grubbing hoe, long handle shovel, pitch fork and steel tampering tool, fiberglass handle limb lopper and post hole digger, (3) yard rakes, (3) pry bars, chains, True Temper hedge trimmers, hatchet, machete and hack saw, hydraulic jacks, contents of shed includes a large assortment of hand and yard tools, socket sets, snow shovel, electric snow blower, electric leaf blower, (4) metal tire rims, gas cans, wood tool bench, drill bits, grease guns, electric meat slicer, household goods, christmas decor and more. (5) Stackable red patio chairs, patio table, umbrella, (2) chairs, corner shelf and metal shepherd’s hook, Large selection of sewing supplies includes Kenmore electric sewing machine, Sheffield china set, Corelle Ware, large assortment of collectible glassware and figurines, large selection of kitchenware items, several collectible dolls, (2) vacuum cleaners and more common household items. I-265 to Charlestown Road Exit 4. South 1/2 mile to left on Blackiston Mill Road. ½ mile to auction on right.